Here in the UK we’re in the midst of National Marmalade Week and to get in the spirit, I talked to Vivien Lloyd, author and winner of the World’s Original Marmalade Festival in 2008 and Fortnum and Mason’s Chutney Challenge in 2012. 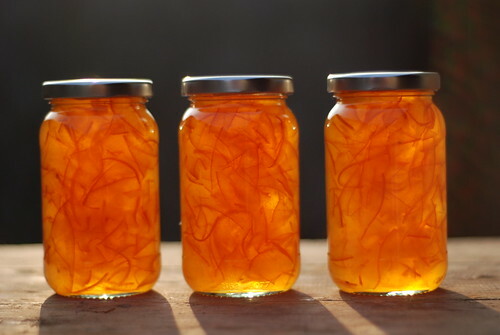 I wrote about this last week on Great British Chefs, and am writing about it again here, because Vivien is simply terrific person, a great writer and hugely generous with her knowledge about making marmalade and preserves. Sharing is how we learn and get better at what we do, and Vivien embraces this virtue in spades. Vivien wrote the book (quite literally) on making marmalade, jam and chutney – her First Preserves book is a fountain of recipes, tips and beautiful photographs that make you want to but out your preserving pan – don’t we all have one of those? – and get your jam on (or marmalade as the case may be, I’ve personally got my eye on Three Fruit Marmalade with grapefruit, lemon and Seville Oranges). So why Marmalade Week right now? Well, making “preserves” is all about preserving the season, and right now, Seville oranges are at their best, which means: it’s marmalade making time. But for preserving newbies like myself, the task is always rife with insecurity: How do I avoid burning the marmalade? How thick/thin should the skin be cut? Any tricks to testing the setting point? 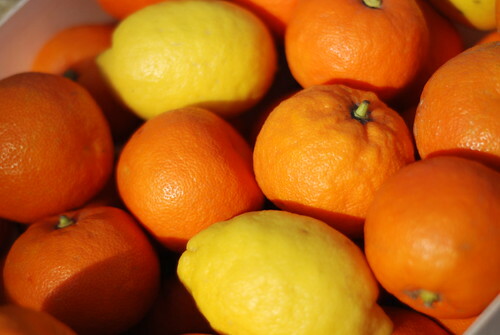 In response to my questions, Vivien kindly shared a few of her choice tips for making great marmalade, plus her super recipe for Seville Orange Marmalade. Thank you, Vivien! Avoid burning marmalade by warming the sugar in a low oven 120C for 15 mins. Dissolve the sugar slowly, on a low heat and bring the pan to a rolling boil gradually. I slice my peel very thinly as thinner peel releases more pectin into the marmalade than thicker peel. Pectin is a gum like substance found in the walls of the fruit. When pectin is combined with the sugar in the recipe it produces the “gel” in the consistency. To test setting point I prefer to use the “flake test”: dip a large spoon into the pan and scoop out a spoonful of marmalade. Lift the spoon above the pan and turn it horizontally. If the marmalade has reached setting point ( 104.5C/220F) it will drip then hang on the side of the spoon like webbed feet. Make small batches of marmalade- 2.25kg yield. Smaller batches give the best colour, consistency and flavour. Large batches take longer to boil to setting point. The longer the boil, the darker the colour, the weaker the flavour and often a syrupy consistency. Invest in a large-lidded stainless steel pan with a capacity of 7 litres. Jam pans aren’t suitable. A lid is essential to manage the first stage of cooking. Without a lid, the water in the recipe may be driven off too quickly and the peel remains tough and under cooked. To get an airtight seal on a marmalade I always use traditional jam jars. Re-cycle jars but buy new twist-top lids. I buy mine from Bottle Company South. Use organic seville oranges if possible. I use oranges from Ave Maria. 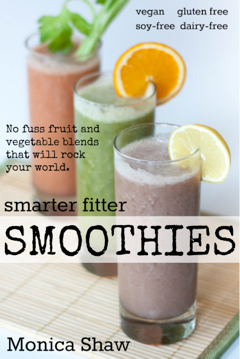 Use a balanced recipe, that is, double the amount of sugar to fruit and sufficient water to soften the peel. I love to see a foodie embrace the spirit of sharing when it comes to the food they’re interested in, and Vivien Lloyd has been spreading the marmalade joy all over the Internet. Visit her website, find her on Twitter or follow her on Pinterest. She also offers workshops for groups and cookery schools. And of course, there’s her books: Her First Preserves book on making jam, chutney and marmalade is as beautiful as it is useful. If it’s just marmalade you’re after, you can also pick up First Preserves: Marmalades as an ebook for iPad. All images courtesy of Robert Walster of Big Blu Design unless otherwise noted. Makes around 2.25kg/5lb of marmalade. Juice the oranges and pour the juice with the water into a large, lidded pan with a capacity of 7 litres. 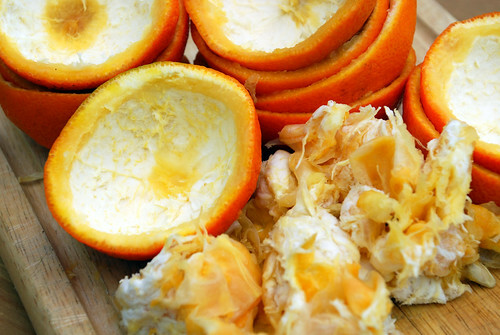 Remove the inner membranes and pips from the oranges. Do not remove the pith from the oranges. Juice the lemon and add the juice to the pan. Put the orange membranes into a food processor or mini-chopper and chop finely.Put the chopped membranes, and any pips into a 30 cm x 30cm piece of thin cotton muslin. Tie this up with string and add to the pan.Slice the oranges and add the peel to the pan. If possible, leave the pan overnight to allow the fruit to soak. Next day, bring the lidded pan to boil, turn down the heat and simmer very gently for two hours. The peel should be very tender and the contents of the pan reduced by a third. Remove the muslin bag and squeeze the liquid from the bag back into the pan through a sieve, using a large spoon.Warm the sugar in a low oven. Add the sugar to the pan and dissolve. Bring the pan to a rolling boil and test for a set after 7 minutes. Leave to cool for 5-10 minutes- a skin should form on the surface. 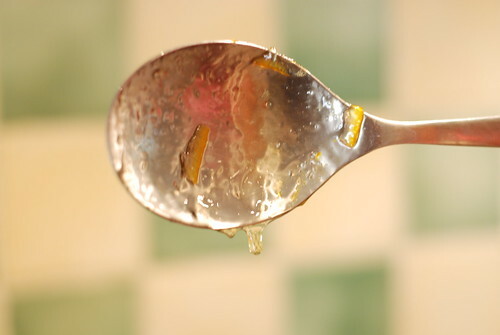 Remove any scum from the surface of the marmalade with a large metal spoon. Gently stir the marmalade to distribute the peel. 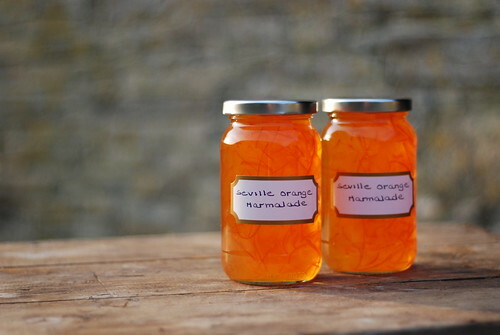 Pour the marmalade into clean, warm sterilised jars and cover with new twist top lids. Alternatively, seal the jars with waxed discs and when cold, apply cellophane covers secured with elastic bands. Leave the jars upright and undisturbed to set. That looks absolutely beautiful! I make preserves, but for some reason I have never made marmalade. I really must try it some time. I also need to make some chutney and jam as I am all out and had to resort to store bought. Tsk! Awesome post–I love all the photos, so light & airy! Plus, the tips will come in handy if I ever get going on a batch of marmalade.